These words taunt me. They pop up unexpectedly in the middle of my day. I run into them around random corners in my thoughts. I feel as if they should be tattooed across my forehead, or emblazoned on my shirt. I have heard these words many times lately- from someone whom I know does not mean to cause me pain, but also from someone else who does intend them as weapons. These words have come to color my thoughts and my actions. Is it an unfair accusation? It’s hard to discount something that you hear from two very disparate sources. I don’t take criticism well, I admit it, and I never have. But I am tangled up in trying to reconcile this accusation with the journey of self-development that I have found myself on. The last three years have been the most transformative of my life. I feel like I have slowly started to awaken from a long, sometimes complacent sleep, a life lived the way I was taught it was “supposed” to be lived. In the words of P.D. Ouspensky, “When one realizes one is asleep, at that moment one is already half-awake.” I have struggled to wake up, and to borrow the imagery of a good friend, I have been peeling away the successive layers of the onion that is my consciousness. But in peeling away these layers and dealing with the flaws revealed by each one, if I find that what lies at the very center is this self-absorption, it feels like the worst sort of paradox. 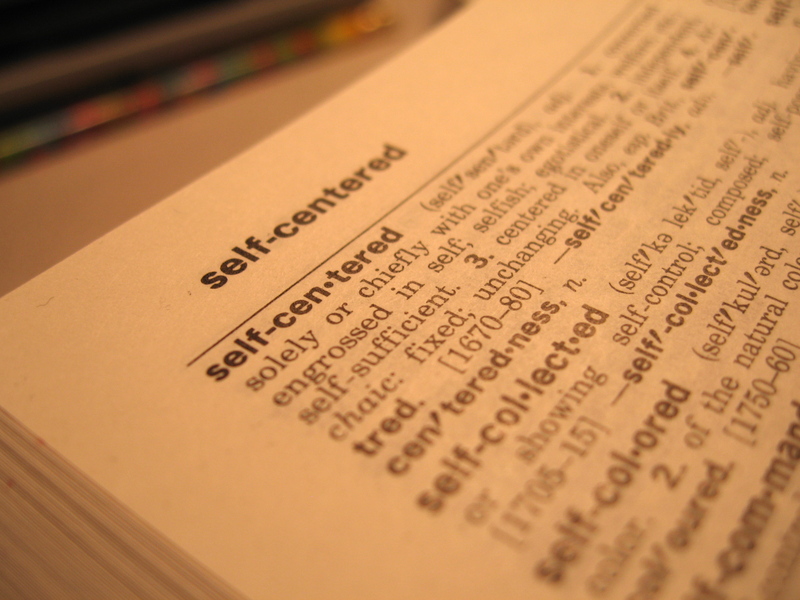 How do I reconcile the search for self-awareness, self-knowledge, and wakeful mindfulness with the resulting “selfishness”? Society teaches us from childhood that we should not be selfish, and yet our culture celebrates selfishness in our admiration of those who are go-getters: ruthless business people, those who have garnered six- or seven-figure incomes through an unrelenting determination to get ahead, usually at the expense of other people. And yet we still pay lip service to the virtues of selflessness, even as we avidly read magazine articles and watch television shows that glamorize the supposedly fascinating lives of the rich and successful and inherently selfish. Women, in particular, are caught in this trap of expectations: we are told to put our children ahead of ourselves, yet at the same time we hear about how we need to take care of ourselves, seek our own fulfillment, pursue our own dreams as a good example to our children. And our consumer-driven society is also selfish, being all about self-gratification. All of this only adds to the paradox: seek self-knowledge and self-fulfillment, but do so in a way that is not self-centered or self-absorbed. The word gnosis, by definition, is a form of knowledge, especially mystical or spiritual knowledge. But the Greek root of the word, gnṓsis, means more specifically, “a seeking to know.” And perhaps I prefer that meaning of the word: the intent, the search for knowledge that might in the end be as common as our everyday selves, not mystical at all. And yet perhaps, in seeking to know ourselves, we can start to see a glimmering of the spiritual and mystical within us all, the sacred spark that all humans share. But as Ouspensky also said, “There is something in us that keeps us where we find ourselves. I think this is the most awful thing of all.” So perhaps I shall continue to struggle, to try to find the balance between selfishness and selflessness, to keep pushing out of my comfort zone, so as to avoid this most awful thing. I can only hope that it might grow easier with time, and that I won’t succumb to the default setting of remaining where I find myself. This entry was posted in Rewording, Spirituality and tagged Marcia Amidon Lusted, Ouspensky, self-centered, selfishness, spirituality, transformation, women. Bookmark the permalink. Marcia, this is wonderful. I have bookmarked your blog. As I read this I realized that for the past two years I have been focusing on myself because sometimes life throws things, people in your path and begs you to consider what are you doing with yourself. And you and I are such introverts we would be compelled to explore it as deep as we can go for as long as it takes. Sorry someone felt badly toward you perhaps it’s a journey they are afraid to take. Keep it up girl – you’re doing great.